When you think of influencer marketing, do you automatically think of celebrities like Kylie Jenner promoting detox tea on Instagram? Influencer marketing is when businesses partner with an individual or company to promote their products to their network. It's a common tacticsfor marketers to implement through blogs, social media, and YouTube videos. Why are they doing this? But small businesses just getting familiar with influencer marketing won't have a shot in the dark with social media stars with millions and millions of followers because every other brand is reaching out, too! This is why micro-influencer marketing is becoming a much more realistic and viable approach to getting more brand exposure. For the purpose of this blog, we'll focus on micro-influencer marketing tactics on Instagram, but what is micro-influencer marketing? It's the act of leveraging individuals with smaller followings to help promote your brand or products. So instead of partnering with accounts with 1M followers, micro-influencer marketing focuses on accounts with say, 10K followers. Let's get real: Your marketing budget can't be tossed around and wasted on efforts that might not get you the results you'd hoped for. As social media influencers grow their following, you can bet that other marketers are recognizing the opportunity to partner with them which increases the demand for a relationship with that account. As we've learned in economics, when demand goes up, price goes up! Focusing on accounts with smaller followings will likely result in more affordable prices for promoting your products. There's often a common thread among accounts with smaller followings: Their fans are individuals who are truly interested in the content that user is publishing. The followers often share common characteristics, which allows you to get an understanding of which accounts mesh well with your brand, not just content-wise, but types of followers, too. Accounts with hundreds of thousands of followers often attract "bandwagon" or "follow4follow" accounts. You Might Already Have Them! Influencer marketing doesn't always have to be initiated from scratch. Sometimes you already have a tight knit group of followers who engage with and share your content. Take a look through your followers to identify a good match for micro-influencer marketing opportunities. As social media becomes a more powerful tool for business, influencer marketing becomes more common. The targeted accounts for influencer marketing likely get hundreds of random direct messages and "want to rep our clothing brand?" comments. How do marketers expect to connect with these people to ensure there's a good fit and communicate the details? Micro-influencers who aren't approached by marketers as often likely have more time to engage with you, talk about your goals and ensure the promotional posts align with them. Context: Would a product promotion fit with their typical posts? Topic: Does the nature of the account mesh with your products or services? Followers: What types of followers are ENGAGING with that accounts content? It's important to dig into the individuals who are actually commenting on the posts, rather than just following. A genuine comment speaks much louder than a follow from a marketer's perspective. 2. Use social media monitoring. Once you've identified some potential micro-influencers, take some time to engage with their content first. Follow them for at least 2-3 weeks, like their posts, and leave thoughtful comments. That way, your request won't come out of left-field. It's easy to tell a generic message that's probably copy and pasted from a unique one. Take your time to draft separate messages for each influencer that shows you did your research. Not sure what an effective micro-influencer request message looks like? Ask us! Some Instagram accounts religiously use DMs as a way to communicate with followers and some just ignore them altogether. With this level of uncertainty, you're best to look for an email address to get in touch with the micro-influencers. Click through to the link in their bio, look through past posts where they might have shared it, search for the individual on Twitter, Facebook, or other social media platforms where their email might be public. Sometimes you can even submit a form on his/her website to get in touch. If you've exchanged DMs with that account in the past, this is probably a viable option for getting in touch. 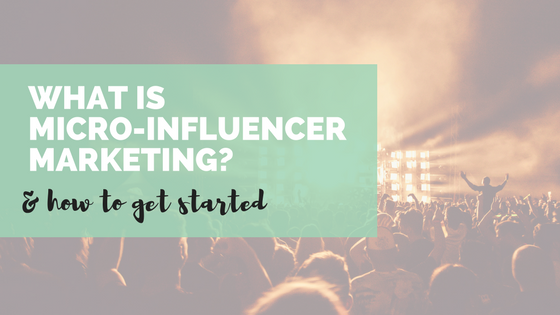 The follow up is what could potentially set you apart from other marketers trying to find influencers. Many businesses broadcast their request to promote their products to any and every account they can, in the hopes that some will respond and agree. Following up after 1-2 weeks shows that you're genuinely interested in forming a partnership with that account. Ready to get started with micro-influencer marketing? Work with a digital marketing expert to take care of the research+outreach to ensure you're approaching the right accounts that will help you take your business to the next level!